Can You Really Make a Living Playing Video Games? It won’t be too long before it’s possible for every player to make a living just by playing video games, writes Dean Anderson. Playing games is a fun, rewarding and transportive experience for millions of people. However, gaming is rarely seen as anything more than an enjoyable hobby. Yet, if you’ve ever tried to complete Dark Souls, nail every challenge in Myst, or just get the better of Mike Tyson in Punch Out!! on the NES, you will understand the skill and dedication it takes. Having a true passion for something means knowing it inside out – becoming an expert – and this a worthy skill, particularly if this knowledge is used to improve the art itself. Where Value Is Shared, It Should Be Financially Rewarded. Developers need dedicated players with the insight and experience to review their work and provide crucial feedback at different stages throughout the creation of their games. Players are also needed to create game mods and additional in-game content to extend the life of titles, and, increasingly, to help in the promotion of games themselves. The time, attention and skills of players add significant value to the games industry, and I believe it’s time this value was fairly recognized and rewarded across the board. There are many sites that reward users with virtual currencies for various activities such as playing and reviewing online games. However, without being pegged to cryptocurrencies, these rewards can be used only on the site itself, or, at best, be converted into retail vouchers. Thankfully, there are a number of platforms working to change this system by allowing anyone to sign-up and start making money. Steemit is a blogging and social networking ecosystem fuelled by blockchain-generated Steem and Steem Dollars for creating and engaging with content. Gamestatix will use a similar model, allowing developers and players to effortlessly find each other and collaborate on many innovative titles. And for every value contribution, players will receive cryptocurrency rewards that can be used to buy games or be exchanged for traditional fiat currencies. So anyone will be able to make ‘real-world’ money simply by playing games, and by taking part in games-related activity. 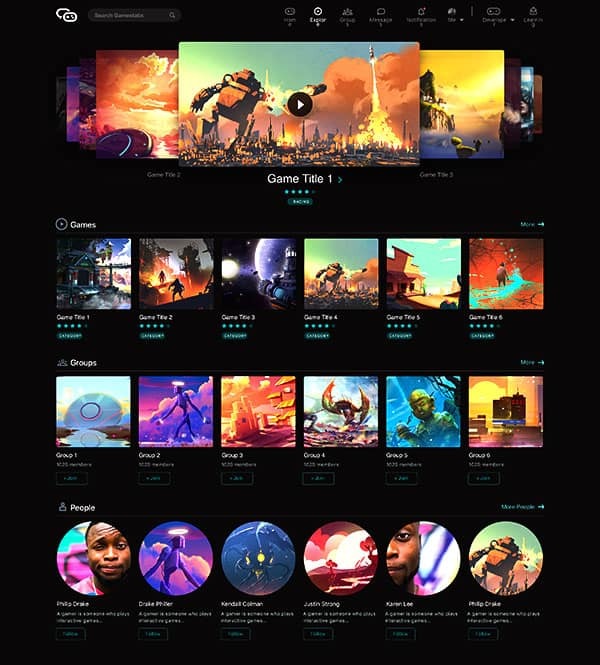 To make it easier for developers to connect with the right players, players will be listed in a directory that details their skills and expertise. So, whether a player’s forte is in finding bugs, exploring every inch of a map, or knowing exactly how a game engine can be used to its full potential, they’ll be listed as such. As players make a name for themselves on platforms such as Gamestatix, they’ll attract more and more opportunities to work with developers. So, skilled players should expect to receive a flurry of invitations to collaborate with their favorite studios. Think about all that goes into the creation and promotion of a game, and it’s clear that a connected global talent pool of players could make all the difference. They have the skills to contribute, and they should be paid to do so. Experienced players are already making masterful additional content that can be used in a variety of different games, and players are constantly sharing social content around their favorite titles, but they have, until now, rarely seen financial rewards for their efforts. Players will be soon able to establish themselves as third-party developers, playtesters or micro influencers, and earn a living doing so. Communities have always been the lifeblood of the games industry and rewarding such community action is long overdue. This new model will be a revolution for the industry, and for the millions of dedicated players who have fuelled it for decades. There are already a number of ways for players to monetize their gaming skills and insight today, but they all come with notable limitations. Livestreaming has become hugely popular over recent years. As soon as internet speeds allowed it, players began broadcasting their play sessions to thousands of transfixed users. Twitch is the most well-known platform, but it’s being rivaled by YouTube gaming. Charismatic players can also make ad and subscriber revenue through podcasting, vlogging, or creating detailed game guides. However, players can only make decent money by building a huge following and allowing ads to be run off the back of it. And due to the masses of competition, only the most popular commentators manage to make a living from such activities. Tournament gaming is another way to make money solely from playing games, but you’ll have to be world-leading to beat the competition and win any cash prizes. Other platforms host competitions and sweepstakes for cash rewards but often require a lot of time, effort, and commitment for such a small chance of winning. Many would cite the use of in-game currencies as evidence of players getting paid, but they are often redeemable only inside the platform and lack any real-world value. One of the few exceptions to that rule is the Sims-esque SecondLife. In this online virtual world, players are able to get a job or set up digital businesses to sell clothes, property, and everything in between for Linden Dollars, which are exchangeable for real-world currency. Amazingly, this really paid-off for one person, Anshe Chung, who became a millionaire via her SecondLife virtual assets. Arguably the most sought-after way to make a living from gaming is by becoming a playtester – the dream job of many players. Its popularity again makes for fierce competition, and jobs are offered only by multinational studios, or in piecemeal form by agencies. Playtesting is also quite an isolated process, with no real opportunity to work directly with developers to co-create and promote games, or even interact with them in a positive way. In the future, I imagine a system where players are financially rewarded for their contributions to the video games industry as a standard – a worker’s right. The fruits of their labour, such as additional content, will be protected by smart contracts, securing the ownership and licensing of such digital assets. And I hope that as players are recognized as laborers, this growing workforce will become unionized and therefore unable to be exploited. Ultimately, it will truly pay to be a skilled player, with financial rewards offered for playing and promoting games, creating content of all kinds, and for collaborating with developers. With this new model in place, it’ll be possible for any player to make a decent living, just by playing games. Dean Anderson is co-founder of Gamestatix, an upcoming social platform for the co-creation of PC games that recognises, encourages and rewards user contribution, whilst giving game developers access to global pool of talent to efficiently generate, curate and promote their content. The company was founded in 2016 by Dean Anderson, Visar Statovci and Valon Statovci. Gamestatix is currently preparing to launch a Token Sale – a form of crowdfunding for cryptocurrency and blockchain projects. « Telecoms in the Next 12 Months: What Will 2018 Bring?